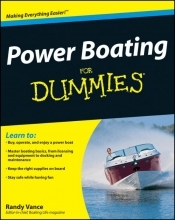 Power Boating For Dummies is a guide to power boating for both new and experienced boaters. It advises readers of necessary boating supplies, safety concerns and equipment, accessories, and includes locations of boating facilities, and how to safely pilot the ship. Part I: Getting On the Right Boating Track. Chapter 1: Powering Up to Be a Boater. Chapter 2: Choosing the Right Boat Type and Engine for Your Boating Needs. Chapter 3: Finding and Buying the Right Boat for You. Chapter 4: Accessorizing Your Boat for Safety and Fun. Part II: Safely Operating Your Boat. Chapter 5: Towing Your Boat and Maintaining Your Trailer. Chapter 6: Launching and Loading Your Trailered Boat. Chapter 7: Hitting the Open Water: Driving Your Boat. Chapter 8: Docking, Rafting Up, and Anchoring. Part III: With Much Boating Fun Comes Much Responsibility. Chapter 9: Rules Do Apply: Navigating to Avoid Collisions and Confusion. Chapter 10: Finding Your Way on the Water. Chapter 11: Navigating Bad Weather. Chapter 12: Preparing for and Handling Boating Emergencies. Part IV: Keeping Your Boat Shipshape. Chapter 13: Keeping Up with Routine Boat Maintenance. Chapter 14: Getting Your Boat Ready for Winter and Spring. Chapter 15: Repairing Leaks and Other Damage to Your Boat. Part V: Enjoying Your Boat. Chapter 16: Finding a Safe Harbor for Your Boat. Chapter 17: The Well-Fed Boater. Chapter 18: Getting Your Feet Wet with Boat Clubs. Chapter 19: Ten Tactics That Separate Pros from Amateurs. Chapter 20: Ten Important Items to Keep Onboard. Chapter 21: Ten (Plus Two) Mechanical Checks for Buying a Pre-Owned Boat.